Protein Blend: (Pea Protein Isolate, Chia Protein, & Cranberry Protein), High Oleic Sunflower (Oil), IMO (Isomalto-Oligosaccharide) (Fiber), Evaporated Cane Sugar, Cocoa Powder, Guar Gum, Natural Flavors, Calcium Phosphate, Stevia Extract, Magnesium Oxide, Ferric Pyrophosphate (Iron), Enzyme Blend (Protease, Papain, Lactase, Amylase, Lipase), Aquamin® Red Algae (Lithothamnium Calcareum)**, Ascorbic Acid, D-Alpha Tocopherol Acetate, Lactospore® (Bacillus Coagulans), Zinc Citrate, Niacinamide, Bioperine® (Black Pepper Extract), Manganese Gluconate, Copper Gluconate, Calcium Pantothenate, Vitamin A Palmitate, Pyridoxine Hydrochloride, Riboflavin, Thiamine Hydrochloride, Chromium Nicotinate, Folic Acid, Biotin, Potassium Iodide, Sodium Molybdate, Selenomethionine, Cholecalciferol, Cyanocobalamin. Mix two level scoops (50 grams) into 8 oz of cold water or a delicious beverage of your choice. Use as a meal replacement one to two times a day. Protein Blend: (Pea Protein Isolate, Chia Protein, & Cranberry Protein), High Oleic Sunflower (Oil), IMO (Isomalto-Oligosaccharide) (Fiber), Evaporated Cane Sugar, Natural Flavors, Guar Gum, Beet Powder (color), Calcium Phosphate, Stevia Extract, Magnesium Oxide, Ferric Pyrophosphate (Iron), Enzyme Blend (Protease, Papain, Lactase, Amylase, Lipase), Aquamin® Red Algae (Lithothamnium Calcareum)**, Ascorbic Acid, D-Alpha Tocopherol Acetate, Lactospore® (Bacillus Coagulans), Zinc Citrate, Niacinamide, Bioperine® (Black Pepper Extract), Manganese Gluconate, Copper Gluconate, Calcium Pantothenate, Vitamin A Palmitate, Pyridoxine Hydrochloride, Riboflavin, Thiamine Hydrochloride, Chromium Nicotinate, Folic Acid, Biotin, Potassium Iodide, Sodium Molybdate, Selenomethionine, Cholecalciferol, Cyanocobalamin. Protein Blend: (Pea Protein Isolate, Chia Protein, & Cranberry Protein), High Oleic Sunflower (Oil), IMO (Isomalto-Oligosaccharide) (Fiber), Evaporated Cane Sugar, Natural Vanilla Flavor, Guar Gum, Calcium Phosphate, Stevia Extract, Magnesium Oxide, Ferric Pyrophosphate (Iron), Enzyme Blend (Protease, Papain, Lactase, Amylase, Lipase), Aquamin® Red Algae (Lithothamnium Calcareum)**, Ascorbic Acid, D-Alpha Tocopherol Acetate, Lactospore® (Bacillus Coagulans), Zinc Citrate, Niacinamide, Bioperine® (Black Pepper Extract), Manganese Gluconate, Copper Gluconate, Calcium Pantothenate, Vitamin A Palmitate, Pyridoxine Hydrochloride, Riboflavin, Thiamine Hydrochloride, Chromium Nicotinate, Folic Acid, Biotin, Potassium Iodide, Sodium Molybdate, Selenomethionine, Cholecalciferol, Cyanocobalamin. 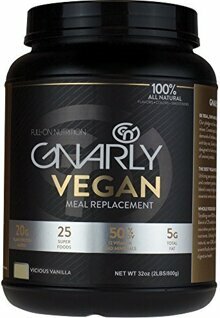 Gnarly Vegan is created specifically for active individuals that need an alternate protein to animal protein. Designed without artificial ingredients and only the highest quality plant proteins making for the best tasting, mixing and most enjoyable plant protein powder on the market. Gnarly plant-based protein powder contains all 9 essential amino acids (phenylalanine, valine, threonine, tryptophan, methionine, leucine, isoleucine, lysine, and histidine). Essential amino acids cannot be synthesized by the body and thus need to be supplied by diet. Gnarly’s Vegan blend is also very high in BCAAs to help your body function optimally. After all, nobody likes excuses. "IT'S A SAD DAY WHEN YOU THE BOTTOM OF YOUR GNARLY VEGAN"
Gnarly Vegan has a rich flavor profile without the chalky, grainy, mouth feel of other plant proteins. Containing pea protein isolate, chia and cranberry proteins, and half the daily vitamins and minerals your body needs makes Gnarly Vegan the perfect vegan protein powder. Furthermore, you’ll be impressed by how well it mixes with water. Our plant, protein powder is pea-based making it naturally fat – and cholesterol free. Being non-dairy makes it the perfect protein for the lactose-intolerant. To top it all, Gnarly Vegan includes digestive enzymes, making it easily digestible to get the nutrients your body needs. 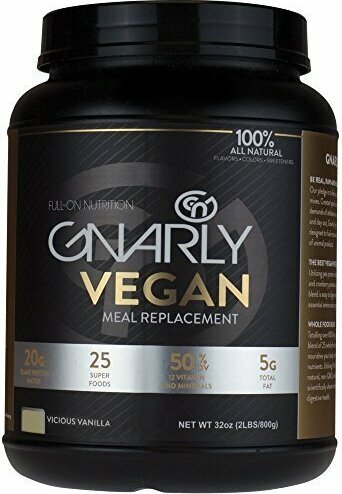 In Gnarly Vegan, you get the protein benefits of whey, but without the animal products. "THERE ISN'T A FUNKY AFTER TASTE LIKE OTHER PLANT PROTEINS"